Friday night and Saturday night, I had two different experiences where I learned that being worried about stuff is a complete waste of time. Friday night I introduced two of my ballroom-dance friends (Kelly and Emily) to Contra dancing, and I was worried that they'd be disappointed if I played piano (in the group of volunteer musicians) all night instead of dancing with them. But I was the only piano player who showed up, so I was on the piano all night, and Kelly and Emily had a great time dancing with everyone else. Then Saturday night I went to a ballroom dance by myself, thinking there'd be extra women wanting to dance with me. Unfortunately, there were no extra women, just a few extra men. So I waited around a bit and was hesitant to leave because I was worried I might miss out if my single-women friends showed up after I left. But leaving when I did turned out to be the absolute best thing, since my timing allowed me to accept an impulse invitation to a party that Danielle was about to attend. The theme of the party was "Bad Christmas Presents". Each person was supposed to bring a bad Christmas present to exchange with someone else. 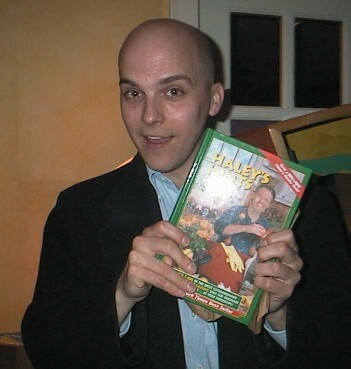 I contributed a goofy candleholder to the pile and was rewarded with a book called Haley's Hints. Danielle swapped her gift box of jelly candies for a hip, happenin' set of napkins. There were other fun gifts in the room, like bra enhancers and a dancing James Brown doll. And there were lots of smiling people, most of whom I had never seen before.